Wow. 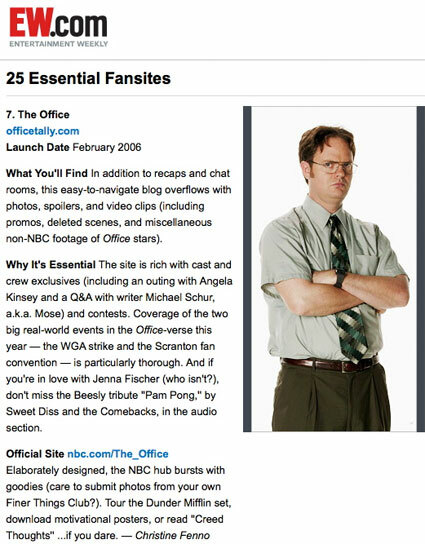 Entertainment Weekly has placed OfficeTally at #7 in its ‘Essential Fansites’ list! I eez … floored. Thank you, EW! And thank you, mighty legion of Tallyheads, for all the fantastic contributions you make to OT, from news tips, to fanvids, to participating in our wacky contests. OT would not be as rich without you! Kudos Tanster. I hope the extra traffic doesn’t crash the site again. Congratulations, Tanster! And thanks to all the Tallyheads who have contributed to this fantastic site. I don’t know how I’d get through a work day without it. WOW! Tanster! That is big time! I’m so excited for you! Congratulations! You deserve every bit of praise and recognition for all the hard work you put into this site. Office fans would be lost without you! Aw Cool! Congratulations — To all the new people, this site is truly an amazing site. It gives you the scoop on everything office related, which keeps me sane at work since it’s one of the few sites that doesn’t get block by my company computer :-) Congrats again, Tanster! Each of these is legendary within its own genre, and The Office fits rightly so into good company. Go Team Tanster! I’m so proud of you :) I got goosebumps reading that little blurb on EW.com and the list of the other sites in the top ten…some company! That is soooo awesome & well deserved! Congrats! p.s. I hope you celebrate this, EW is big time recognition!!! EW is always right. It’s probably the most respected and accurate magazine in the indrustry! Well deserved!!! This site has proved essential to my daily life and I’m sure to many others! Congrats, Tanster. No one deserves it more. Congrats, Jennie. All that lost sleep has paid off!! holy crap tanster, that’s awesome!! you’re up there with fansites for the most commercial and most legendary shows/movies/bands ever! well of course it is!! Wow Tanster! Bringing out the guns. Nice. Well… no one deserves this honor more than you! Congrats on the site’s success! woah !! ::hugs:: that’s awesome, Tanster. Congrats Jennie! This is beyond cool. I saw this on their website earlier today! Congrats, Tanster! Its well deserved! that would explain the exponential jump in photo hits on my Flickr.. i had 1000 visits to Ed Helms picture just yesterday! (Yawn) I can’t say that this surprises me. ;) I mean, you rock!! The only thing that does surprise me is that it’s not the #1 fansite. At least it is in my heart. :) Way to go, Jennie!! Pretty sweet Christmas present, huh Jennie? You deserve it! Yeah for Office Tally! Did they notify you or did you have to scour for this yourself? Bloody hell. Where’s my dunce cap? You so deserve it! This site is amazing! Well, yeah, of course it’s marked as an “essential.” Cause it is. OT has been one of my homepages since I discovered it last summer. Congrats on the honor!!! OMG!! Congratulations, Jennie! How awesome to get such big-name recognition for something we Tallyheads have known all along. ;-) I’m so happy for you – and eternally grateful for all your hard work, as always! Go Tanster! I don’t know how I could get through the day without looking at OT at least once. I get as much enjoyment out of coming to the site and seeing a new interview or spoiler as I do watching the show. Thank you so much for all you do – you’re amazing! WOW- good for you! Did you ever think it when you started the site? Also, just want to share how sad I am that Pam and Jim are finally together and this strike is now going to last a whole lot longer than originally thought. The Office is my favorite past time…..
Didn’t know where else to write this – just wanted to share it with you, Tanster! Keep up all the awesomeness, Tanster! I’ve checked this site at least once a day since it was just a leetle baby site. If you hadn’t been included, I’d have filed a complaint. Keep on keepin’ on, Tanster. No surprise! We are all so happy for you, Tanster! Congrats tanster! That is so cool to be recognized by EW – you know you and OT are #1 to all of us! Congratulations Tanster! My favorite magazine highlighted my favorite website!! WOW! I have to say a big thank you for making this great site. I’ve been active with the Survivor Season 2 poll, but decided to comment here, out of the great respect I have for your policy. I didn’t want to break it by posting something off-topic. Although, maybe Tanster praise is one topic that is never “off”. I just found some Tallyhead Talking Head contest entries on YouTube–and it was so entertaining. And it was fun to see everyday people work so hard to do justice to what we enjoy so much. I laughed a lot. I have to express how impressive you are — how organized and well-managed this “place” is. You must be very balanced in both diligence and fun. I am in love with the show and everything about it, and especially since the strike you have made it possible to keep the love alive. Everything from the banner, to the links and categories on the left; the spoilers, ancillary blogs, and videos…it is no wonder that this is an award winning fan site.